This project, a capacitive fluid level sensor from 1991,? shows how to create a simple liquid level sensor using only a single probe. 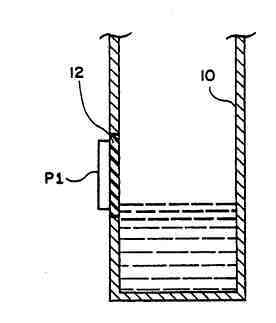 This is a capacitive sensor that utilized the fact that changes in liquid level alter the dielectric contant of plates attached to the fluid container (when the plates are viewed as a capacitor). 1. The containter case itself. 2. A probe attached to the container (and electrically isolated from it). Note that the probe does not come into contact with the internal liquid. 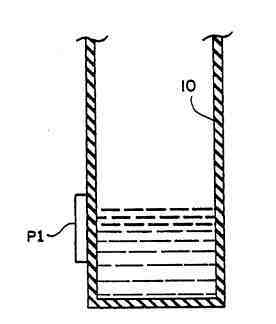 One plate of the sensor capacitor is a probe disposed within a receptacle while a grounded conductive portion of the receptacle is a second plate of the capacitor. The liquid within the receptacle acts as a dielectric between the plates. Other devices utilize an electrical probe to detect fluid levels by measuring the conductivity of the fluid. However, these devices require complicated current amplifying systems because there is often an insufficient amount of current passing through the electrodes to power an indicator lamp. Several systems have been developed using both intrusive and non-intrusive capacitive means to sense fluid levels contained in receptacles. The non-intrusive systems typically involve wave propagation techniques which are implemented through a transmitter/receiver system. Typically, these systems involve the transmission of an ultrasonic signal from a transmitting transducer through a fluid to a receiving transducer. However, a failure in the transducer pair or in their respective electronic connections results in a lack of signal from the receiving transducer which, in turn, activates the normal failure mode, thereby falsely indicating a dry or no fluid present state. The increasing importance of monitoring fluid levels in automotive and other applications creates a need for more reliable intrusive and non-intrusive fluid level sensors. The present design utilizes capacitive principles to sense the level of a liquid contained within a receptacle. As a liquid rises and falls in the container, the dielectric effect of the liquid changes the effective capacitance of the sensing capacitor which is detected by electronic circuitry coupled to the sensor. In an illustrative embodiment, one plate of the sensor capacitor is a probe disposed within a receptacle while a grounded conductive portion of the receptacle is a second plate of the capacitor. The liquid within the receptacle acts as a dielectric between the plates. FIG. 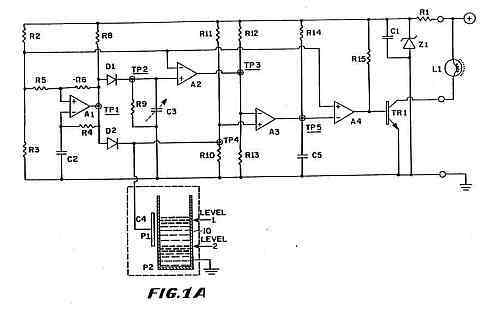 1A illustrates the circuit diagram of one embodiment of the fluid level detector of the present design. The supply voltage for this circuit is typically provided by a 12-volt automobile battery which is reduced to a 5-volt DC source voltage by means of a voltage regulator comprising the combination of resistor R1 and zener diode Z1. Capacitor C1 serves as a filter for this voltage supply regulator. The output of the square-wave oscillator described above is shown as the square wave of FIG. 2A. The oscillator produces an alternating electrical output which causes capacitors C3 and C4 to charge through diodes D1 and D2, respectively, where capacitor C4 is a sensor capacitor and capacitor C3 is a reference capacitor. As stated, capacitor C4 is the sensor capacitor wherein the two conductive surfaces of the capacitor are plate Pl and the residual ground of the receptacle 10 through its mounting arrangement. The dielectric of the capacitor is the fluid in the receptacle 10 such that the capacitance value of C4 varies relative to the fluid level in the receptacle. Referring again to FIG. 1A, voltage comparator A2 compares the voltage at test point 2 (TP2) with the reference voltage set by resistors R2 and R3. FIGS. 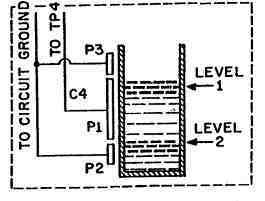 2B and 2C illustrate that when the voltage at TP2 decreases below the reference voltage V1, due to the discharge of capacitor C3, the output of the comparator A2 reference voltage at TP3 drops to zero. This causes a current pulse to be output by comparator A3 during the period in which the discharge voltage from capacitor C4 is less than the voltage output from comparator A2. The current pulse causes capacitor C5 to discharge, thereby allowing the output of comparator A4 to rise and allowing current to flow through transistor TR1 to light lamp L1. An exploded perspective view of the present design is shown in FIG. 3A and FIG. 3B where sensor plate P1 is shown as an integral part of the assembled unit. 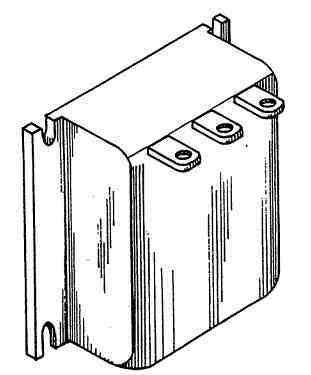 In an alternative embodiment, capacitor plate Pl can be physically separated from the electronic circuitry of the design such that the sensor plate Pl is attached to the fluid receptacle and is electronically coupled to the corresponding electronic circuitry located at a position which is isolated from the receptacle. In accordance with the present design, as shown in FIGS. 4A and 4B, the sensing capacitor plate P1 can be mounted to the receptacle 10 in various ways, depending on whether the receptacle 10 is made of a conductive or a non-conductive material. In one embodiment of the design shown in FIG. 4A, the fluid receptacle 10 is completely made of a non-conductive material, and the sensing capacitor plate Pl is mounted directly to the surface of the receptacle 10. In another embodiment of the design shown in FIG. 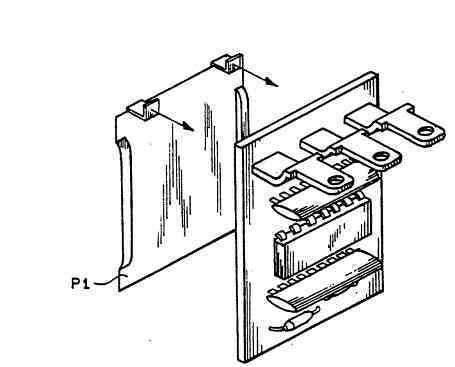 4B, the receptacle 10 is made of a conductive material except for a relatively small window 12 of non-conductive material making up a portion of a wall of the receptacle 10 upon which the capacitive plate Pl is mounted. Referring to FIG. 5, as discussed in the previous embodiment, the supply voltage for the circuit is reduced to a 5-volt DC source voltage by means of a voltage regulator comprising the combination of resistor R1' and zener diode Z1. Capacitor C1' serves as a filter for this voltage supply regulator. Amplifier A1' in conjunction with a resistor/capacitor network R4' and C2' and resistors R5' and R6', form a square wave oscillator. 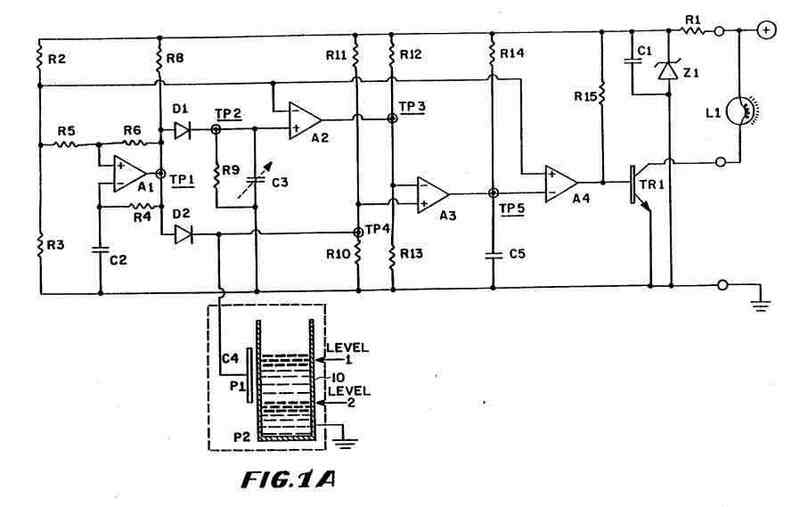 A reference voltage is supplied from the voltage regulator where the reference voltage value is determined by the voltage divider circuit R2'/R3'. This voltage serves as a reference voltage for the square wave oscillator and voltage comparator A2' located in the circuit, as will be described. The output of the square-wave oscillator described above is shown as the square wave of FIG. 6A. The oscillator produces an alternating electrical output which causes capacitors C6' and C7' to charge through diodes D1' and D2', respectively, where capacitor C7' is a sensor capacitor constructed of a capacitor C8' and a capacitor including the capacitive probe C9' connected in parallel and capacitor C6' is a reference capacitor. Capacitor C7' is similar in function to capacitor C4 of the previous embodiments and is the sensor capacitor wherein the two conductive surfaces of the capacitor are probe C9' and the residual ground of the receptacle through its mounting arrangement. The dielectric of the capacitor is the fluid in the receptacle such that the capacitance value of the capacitor comprised of C9' and the conductive grounded portion of the receptacle, and hence the combined capacitive value C7' varies relative to the fluid level in the receptacle. In the illustrative embodiment, the capacitive probe C9' for use in oil level sensing is a wire, such as a 22AWG wire with approximately 7-11pf capacitance. For water sensing, the illustrative 22AWG wire has 0.12 inch outer diameter of insulation and has a capacitance of approximately 5-20pf. The capacitance value of capacitor C6' is adjustable to match the value of capacitor C7' when a predetermined liquid level is sensed. When the voltage from the oscillator circuit at test point 1' (TP1') makes a transition from positive to negative, capacitors C7' and C6' begin to discharge through resistors R9' and R10', respectively. It is the difference in voltage decay across resistors R9' and R10' due to the capacitance values of capacitors C7' and C6' which enables the circuit to determine the level of fluid in the receptacle. The voltage comparator A2' compares the voltage at test point 2' (TP2') with the reference voltage set by resistors R2' and R3'. FIGS. 6B and 6C illustrate that when the voltage at TP2' decreases below the reference voltage determined by the voltage divider R2' and R3', due to the discharge of capacitor C7', the output of the comparator A2' reference voltage at TP3' drops to zero. The time between the point where capacitor C7' begins to discharge and the output of the comparator A2' drops to zero is used as a reference time T. Similarly, the comparator A3' compares the square wave output of the comparator A2' with the voltage decay signal across resistor R10' due to reference capacitor C6' at test point TP4'. As shown in FIGS. 6C-6E, if the discharge time of reference capacitor C6' is longer than the reference time T established by the comparator A2', the output of the comparator A3' remains high. Conversely, if discharge time of reference capacitor C6' is shorter than reference time T, due to a faster discharge rate in C6', the output of the comparator A3' pulses low for a period of time in which the discharge voltage at TP4' is less than the output voltage of the comparator A2' (TP3'). In application, this pulse is actually a current pulse rather than a voltage pulse. A diode D3' is connected to test point 3' (TP3') to increase the temperature stability of the device. The output of the comparator A3' is an open collector type output which allows capacitor C5' to charge through resistors R14' and R16'. If the output of A3' pulses low, capacitor C5' discharges to ground and the voltage at test point 5' (TP5') goes to zero. The combination of resistors R14', R16', and R17' and capacitor C5' act as an integrator whose output is the input to the base of a transistor TR1' which is a first transistor in an emitter-follower pair including TR1', TR2' and resistors R18', R19', and R20'. The integrated voltage at testpoint 5' (TP5') determines the amount of current flowing through transistor TR2' to ground. The resulting voltage drop across resistor R20' determines the voltage between test point 6' (TP6') corresponding with output 01, and ground. In the embodiment shown, this output is substantially linearly dependent upon the pulse width of the negative going signal present at testpoint 1' (TP1') and hence is substantially proportional to the relative decay times of capacitors C6' and C7'. In turn, since the relative capacitances between C6' and C7' is proportional to the amount of dielectric (fluid) adjacent probe C9' the output voltage at 01 is substantially linearly proportional to the amount of fluid in the reservoir. The output voltage at testpoint 6' (TP6') is also an input to a comparator A4'. The other input of comparator A4' is determined by a voltage divider made of resistors R21' and R22'. The combination of these resistors provide a reference voltage to the comparator A4' such that when the voltage at testpoint 6' (TP6') is less than the reference voltage produced by the divider R21' and R22', the output of the comparator A4' is zero. The output of the comparator A4' is the base voltage of a transistor TR3' and hence determines whether current flows through transistor TR3' by way of resistor output 02 and can be used to control the switching on and off of an indicator light or such in response to the fluid level determined by C7' being below a predetermined amount. By choosing various values of resistors R21' and R22' or alternatively by using a variable resistor for R21' or R22', the setpoint at which the transistor conducts and hence provides an output voltage at output 02, can be varied. 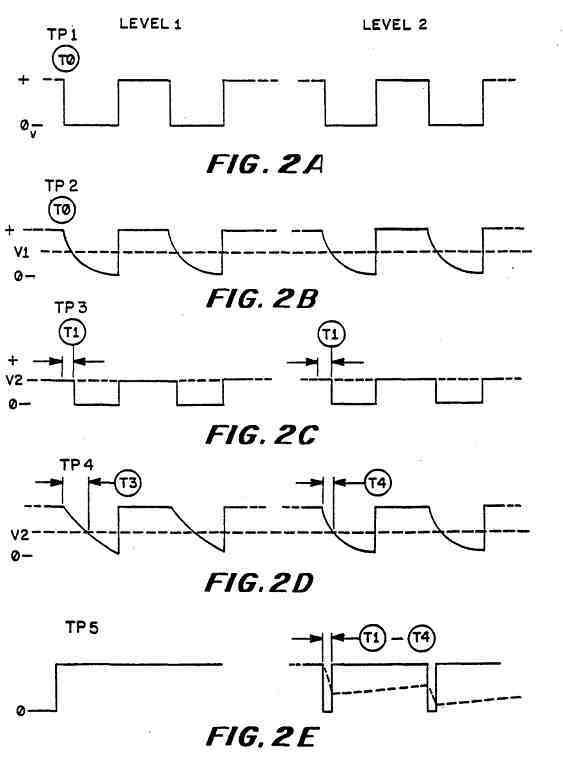 Although the illustrative embodiment has been described herein as incorporating transistors, one of skill in the art can appreciate that other switching means, such as FETs or mechanical switching means can be similarly substituted therefor. 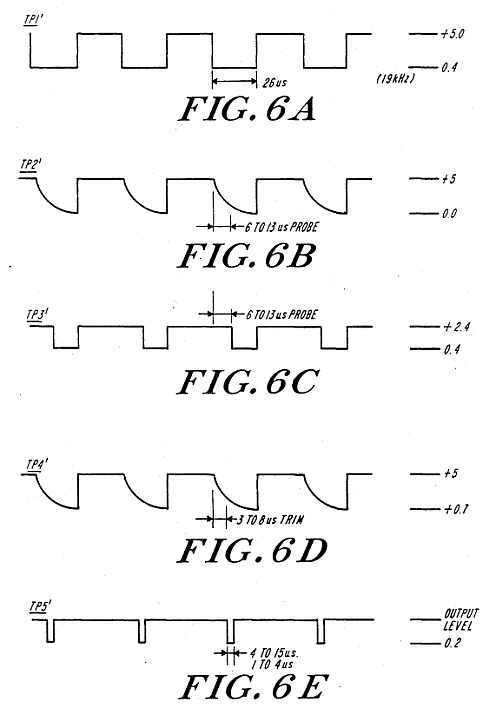 While in one embodiment a probe is indicated herein as being a wire of a certain gauge, it can be appreciated that other wire sizes or probe means can be used in the present design. Although the design has been shown and described with respect to exemplary embodiments thereof, various other changes, omissions and additions in form and detail thereof may be made therein without departing from the the spirit and scope of the design.